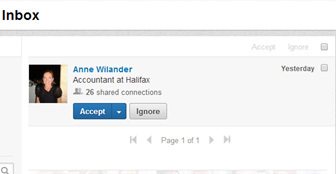 I got a new scam linking request, now from Halifax and Anne Wilander. 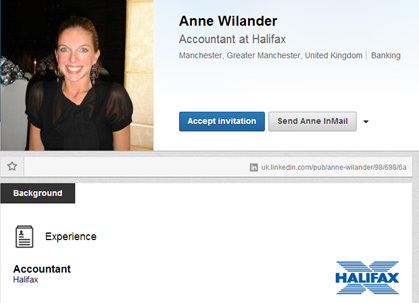 Same hacking and scamming going on as was with Marie Gustafsson at Resurs Bank, then Halifax. 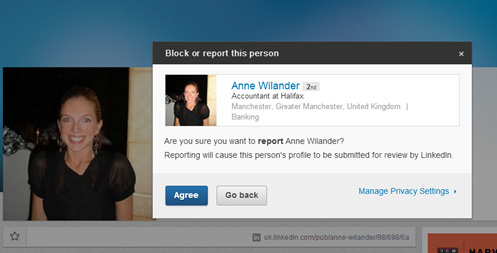 I reported this to LinkedIn several months ago, but it seems nothing is done by their part. I have also let the companies know someone is hacking and misusing their company accounts. You can read in the previous blog post how Resurs Bank responded to me. The first blog post regarding this case got many comments. Please see them under the previous blog post. Be careful out there – do not connect with anyone from Halifax, UK. It is a start to a scamming and spamming project. I wrote to LinkedIn again. Reported this new case. Let’s hope they react to all the reports they have got globally around this case. kesäkuu 5, 2014 in In English, LinkedIn. ← Tuottava somemarkkinointi ja rohkeuden voima! Thanks for this, Johanna. People do need to know and be more careful with the connections they make and the access they give to their profile. I recently got a similar case. Someone using the name of the Barclays Bank. He sent me a message asking how I was, how was work and family, and wishing a good day. I suppose they are people out there who are willing to volunteers answers to those too personal questions to strangers. I Googled the person, Williams White, from Nigeria, according to the profile. I found nothing. I blocked him. I thought of reporting to LinkedIn.